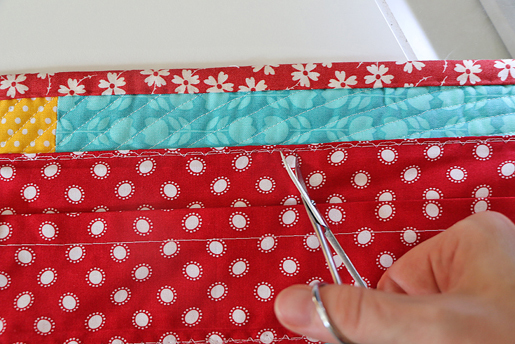 Easy DIY Quilt Hanging Sleeve – Almost Entirely by Machine! I’m Lee from Freshly Pieced, and I am so excited to be writing my first tutorial for We All Sew! 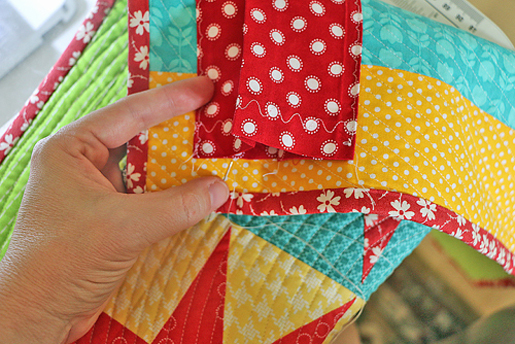 Today I’m going to be showing you how to make and attach a quilt hanging sleeve to the back of a quilt with almost no hand-stitching. (Almost!) That got your attention, didn’t it? Blindhem foot, such as BERNINA Blindstitch Foot #5, which is a standard accessory with many sewing machines. Check your sewing machine guide to see if your machine has one, and which stitch is the blind stitch or blind hem stitch. It’s nearly invisible on the quilt front! I can’t claim to be the one who came up with this brilliant technique – my tutorial is based on this excellent video by Felisa Quilts. But since the video is captioned in Japanese and all the measurements are in centimeters, WeAllSew asked me to break it down in English and inches for all of you. Still, I urge you to check out the video anyway, to further illustrate how this works! This tutorial is for a 4″ quilt hanging sleeve—a bit larger than the one shown in the video, but a 4″ sleeve is standard for many shows here in the U.S. Step 1) Prepare the sleeve. 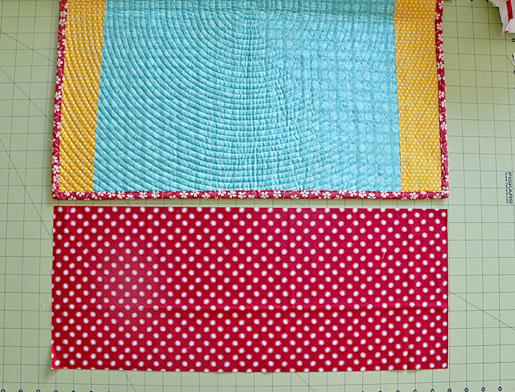 Cut fabric for your sleeve, 9″ by the width of quilt. 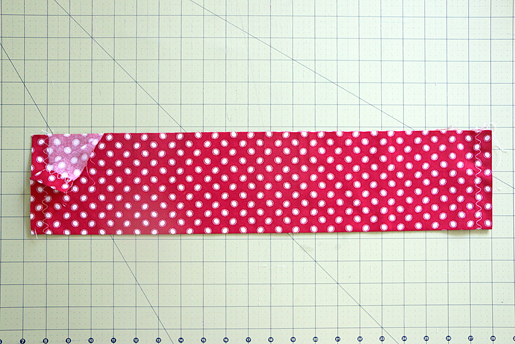 On the shorter (9″) sides, measure 1.5″ in from the raw edges and mark. Press raw edges in to meet the marked line you just made. On your machine, select the running stitch (no. 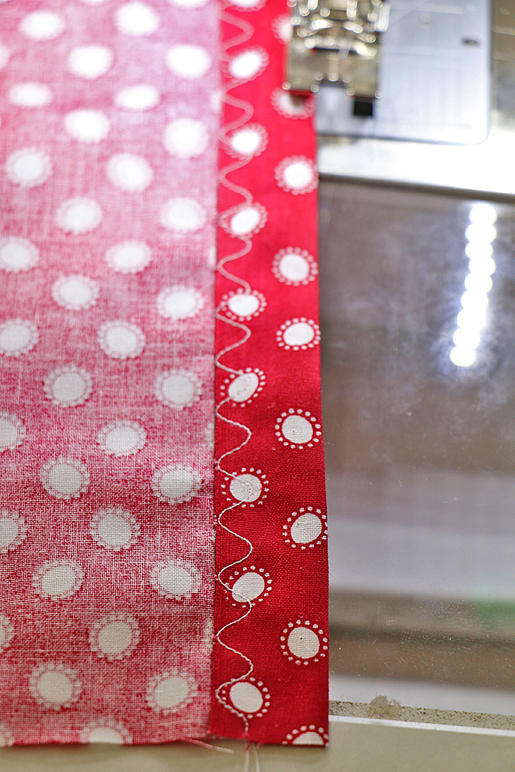 4 on my BERNINA sewing machine), and adjust the stitch length to 1.0 mm. Using your walking foot (or dual-feed foot #1D with dual feed engaged), stitch over the pressed-in raw edges. 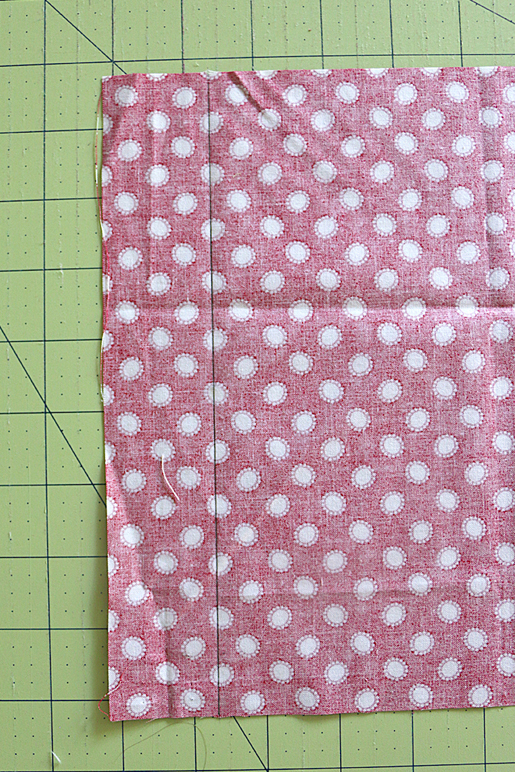 Fold the sleeve in half lengthwise, wrong sides together. 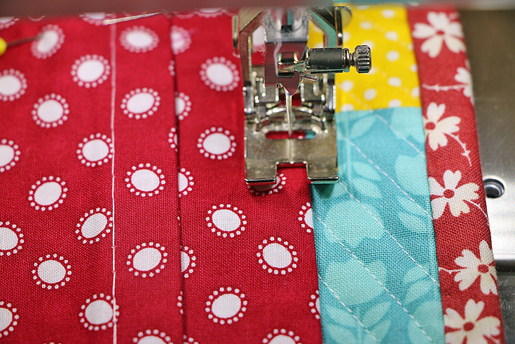 Switch your machine back to a straight stitch and sew 1/2″ in from the raw edges, back-stitching a few times at the beginning and end. 8. Press the entire sleeve flat, as shown. 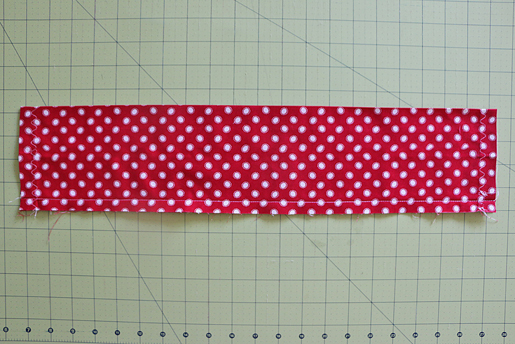 Now adjust the length on your straight stitch to 6.0 mm, and set the tension to 2.0. 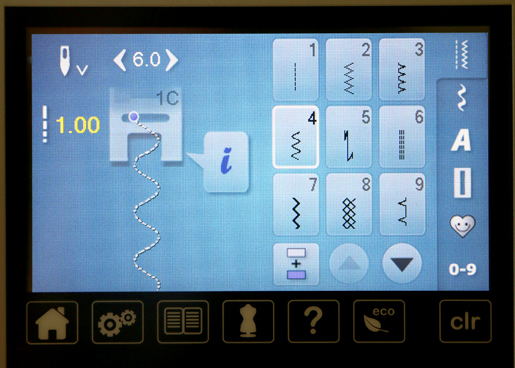 On my BERNINA 7 Series machine, tension adjustment is in the “i” menu, the button at the upper right. 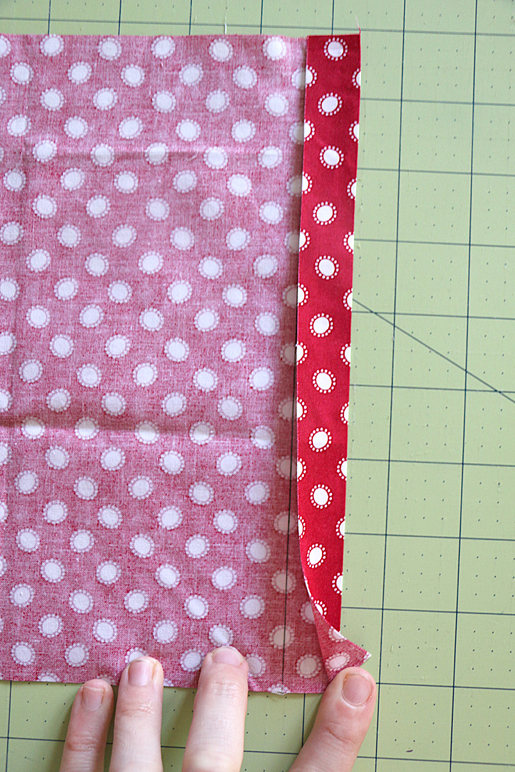 Turn the sleeve so that the two seams are in the center, with the raw-edge seam on top. 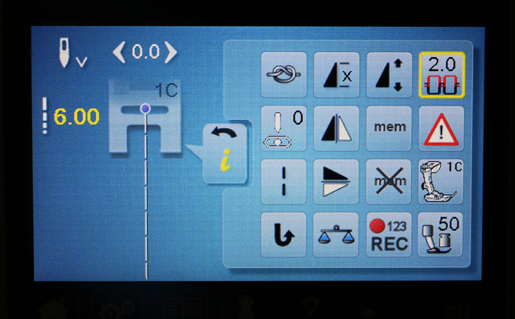 Press that seam open, as shown (the basted seam at the back should of course be pressed to one side or the other – it doesn’t matter which way). Step 2) Attach the sleeve to the quilt back. Center the sleeve along the back of the quilt, 1″ below the binding, with the raw edge seam facing the quilt back, basted seam facing you. Pin into place. Go back to your machine, leaving the same straight-stitch settings in place, since we’ll continue to use a basting stitch here (6.0 mm stitch length, 2.0 tension). 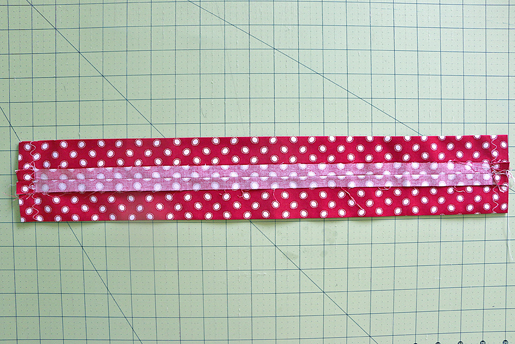 Stitch along each long edge of your quilt sleeve, 1/8″ from the folded edge. 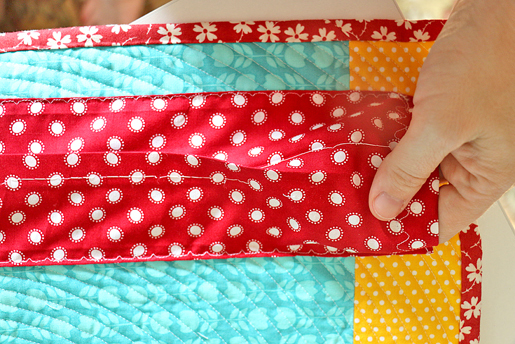 Yes, you will be stitching right through your quilt! I know it’s a little scary, but just bear with me here. When both edges are basted, it should look like this. And the front of the quilt will look like this. You can see the basting stitches, but don’t worry – we’ll take them out later. 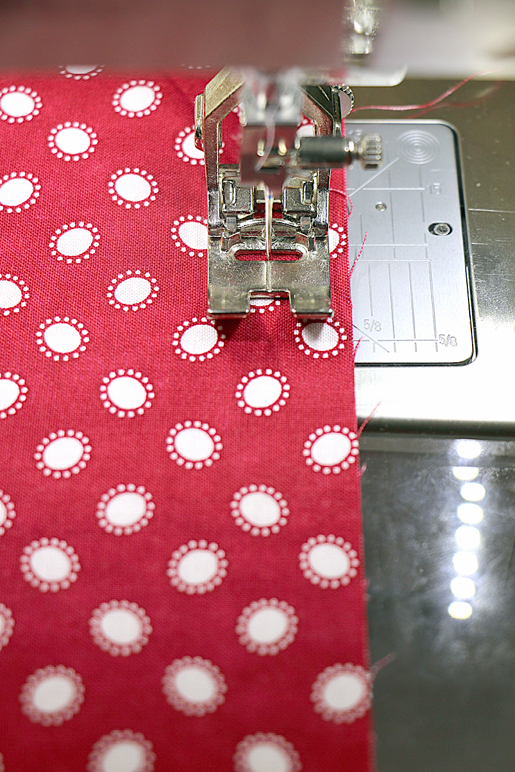 Next, select the blind hem stitch on your machine (stitch #9 on my BERNINA 7 50 QE). 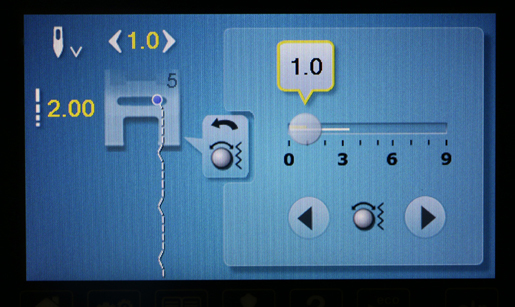 Adjust your stitch length to 2.0 mm and stitch width to 1.0 (note that these are slightly different settings than what is shown in the video). Now here’s where I’m going to do things a little differently than in the video. 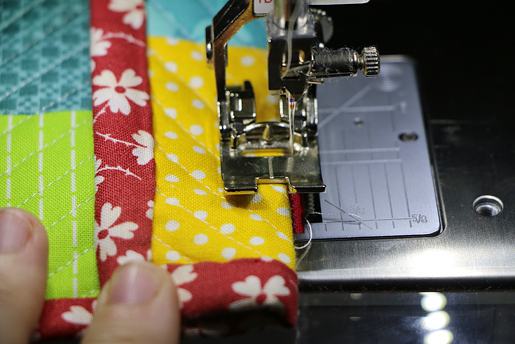 At this point, the video has you switch to the blindstitch foot for your machine. After some experimentation, I found that I preferred to stick with foot #1D and dual feed. With such a narrow width on your blind hem stitch, I liked the extra visibility foot #1D gave me, and felt I had better control over where my stitches were going. But if you prefer to use your blindstitch foot, you can certainly use that foot as well. I recommend trying both on a piece of scrap fabric before you start, and go with whichever foot you feel gives better results. The walking foot with the edgestitch sole attached is also a good option. 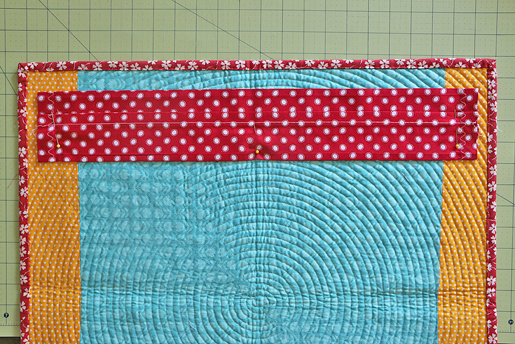 Now fold back the quilt, away from the sleeve, as shown. You should be able to just see the edge of the sleeve sticking out, as shown in the photo. I found it worked well to line up the fold of the quilt just a smidge to the left of the “toe” of my machine, as shown. Now, I’m a quilter—I have very little experience in sewing garments. So I admit, I had never done a bindhem stitch before this! 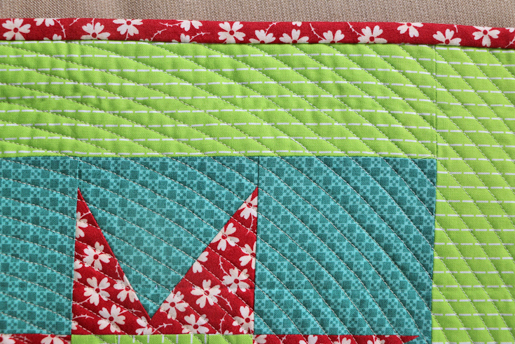 If you are similarly inexperienced with this stitch, it’s actually much easier than it looks. 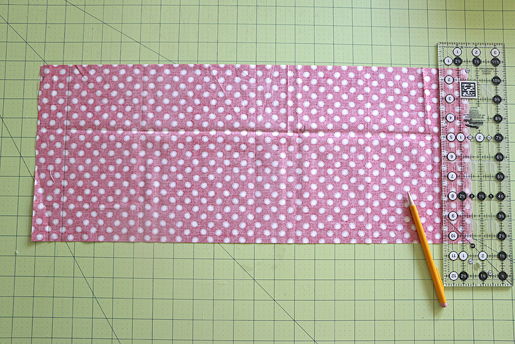 Still, you may want to practice on a folded piece of fabric first, so you can get a feel for how the stitch works. 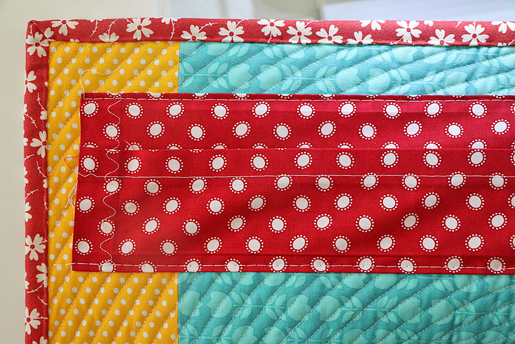 Once you’re ready to go for it on the actual quilt, just keep in mind that you should be stitching primarily on the sleeve, with every few stitches just barely catching the folded edge of the quilt. 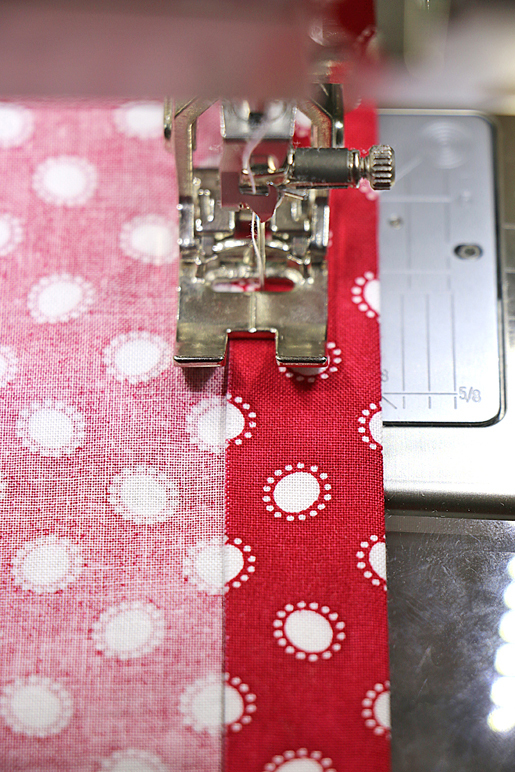 Since a quilt has three layers, including batting, there’s a bit more room for error than when you’re sewing a standard hem. But go slowly, and, if possible, I recommend using thread that blends well with the front of the quilt, just in case a stitch or two comes through. Backstitch a few times at the beginning and end of the seam. Do this along both long basted edges of the sleeve. At this point, you do still have to get out the needle and thread to do some hand-stitching. But only along the short edges of the sleeve—so depending on the width of your quilt, you’ve just saved yourself a boatload of time. And there you have it, a perfect hanging sleeve with a bare minimum of hand-stitching! Here’s the front of my quilt, with no stitches showing through! I love it! Thank you to Felisa Quilts for the wonderful and informative video of this technique. I hope you all enjoyed it! I’ll be back in just a few short weeks with my first Bernina project tutorial. 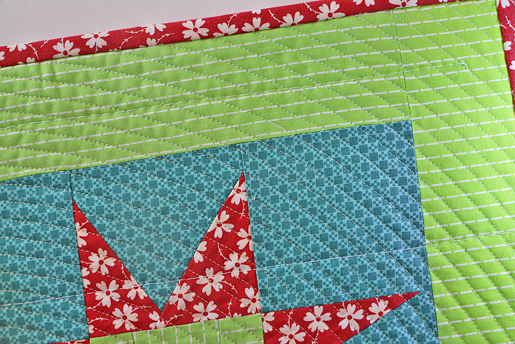 Meanwhile, please visit me at Freshly Pieced for more quilt inspiration! Well done tutorial. I did not need the video at all. Thank you. This is brilliant. 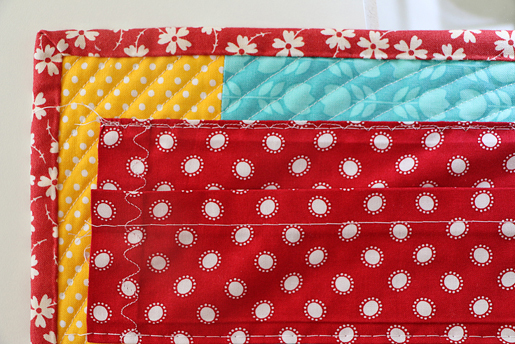 I have a stack of mini quilts to stitch up this weekend. Thanks for the timely tip! This looks like a terrific technique. Can’t wait to try it on the wall hanging I am about to load onto my quilt frame. Thanks for the translation and explanation. Nice presentation; however, at my age, I know I won’t remember it when I need it. Would be nice to have a PDF to download. When I did the blind hem stitch, I had a little pleat or pucker on the back of the sleeve. I don’t know how I could have eliminated this. Any ideas? I ended up using foot #34 after trying walking foot with edgestitch sole, blind hemmer, #10, etc. It worked well. The sleeve just didn’t turn out as neat as I would have liked. If you’ll send me a picture of where the pucker is, maybe I can help figure out what happened – Jo – WeAllSew@berninausa.com. This is a wonderful idea and so quick and easy. Thank you. Omg, this is awesome! Definitely pinning to find this again! Thank you for adding this to the email newsletter! Thanks. This was a great tutorial. I found I had better visibility and accuracy with the 20D foot for sewing the sleeve with the blind hem stitch.